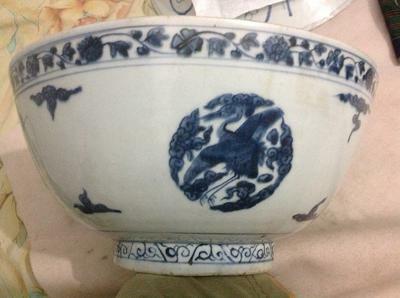 This bowl had been in my collection for few years. My research said it was Ming's. As always I need you and other expert opinion. Dimension is 28 cm diameter and 14 cm high. Thank you. Thank you both for your positive feedback. At first after I read Peter info (very fast response) I think my bowl date to jiajing, thank for Tim to correct me. Actually I have a problem about gloss which I will present next post. I will now prepare my material. thank you. pieces. I feel with the crane motif, gritty foot rim and the dark cobalt blue used this is a Wanli or transitional piece. Appears indeed to be Ming. The foot rim and mark indicate that it could be from the mid-Ming period. The main picture appears to be a "duanhe", a crane in a circle. The mark is a "Fugui Jiaqi" mark.